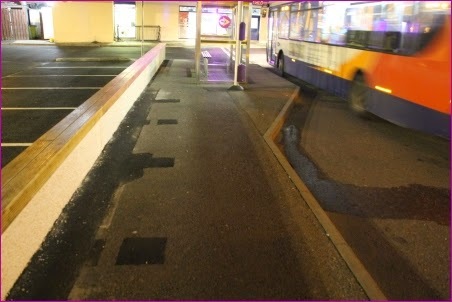 A Gurn from Nurn: Bus Station Benches - when did they go? Here you can see the spot where there used to be benches at the bus station. One of our regular readers believes they were removed very recently. This observer thinks he might have seen them there up until recently too but the mind can play tricks. They are clearly to be seen in an image posted in May on the popular Facebook site "Nairn when you were a Bairn". Anyone know when and why they went? NO but seems to have been replaced by a a much longer one. Yes fine if you are agile enough and don't need any back support anon. The seats were a little lower and more suitable for some of us perhaps. Point taken however. Over the past couple of months several black benches have appeared down at the playpark by the Jubilee bridge with one being installed in the last few weeks. Could that be one of the missing three? I see from the photo that there is a small wall with wooden slats on top of it behind the bus shelter, is this what folk are supposed to sit on now? Why couldn't they have left at least 1 bench? Obviously designed by someone who never has to wait for buses! Why not consult one of your concillors ?